Expect well-dressed attendees, art deco décor, ample Arizona craft beer and a whole lot more when the inaugural Brewers Ball kicks off this fall at the Arizona Biltmore. Cocktail-attired guests will relive the glitz and glamour of the Roaring 20s in this intimate, Great Gatsby-inspired affair set for 6:30 pm – 10 pm Friday, Nov. 18 in the Biltmore’s iconic Gold Room, the resort’s original dining area. 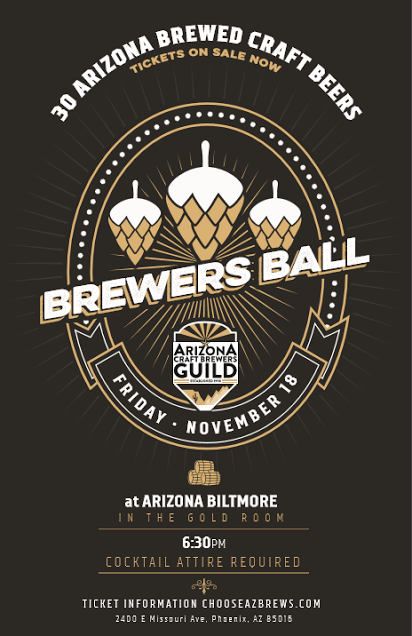 In addition to an array of award winning Arizona craft beers available for sampling, the Brewers Ball features an expansive, buffet-style dinner offering courtesy of the Biltmore’s award-winning Executive Chef, Stephen Strickland. Guests can enjoy starters such as Roasted Pumpkin + Sweet Potato Bisque paired with a recommended award winning and nationally recognized Arizona craft beers (to be released soon), and main course options including Balsamic Beer-Braised Beef Short Rib and Rosemary Roasted Pork Loin with additional beer pairing recommendations, among others. Vegetarian and dessert options are also on the menu, so don’t miss this chance to don your best apparel, drink and dine amidst industry insiders, bust out those swing moves and sample an assortment of Arizona’s very best craft brews. Tickets are available now in limited quantity and for a very short time at the presale price of $100 per person + tax + gratuity. For tickets, visit Eventbrite.com. For more on the Brewers Ball, visit ChooseAZBrews.com. Tickets: $125 per person + tax + gratuity; available at Eventbrite.com. This price is only good for a very limited time as there are a few spots available. There are 12 VIP tables available for purchase. Those looking to purchase a table, should contact Tiffany@craftbeeraz.com for pricing and details. The Arizona Craft Brewers Guild was established in 1998 and represents nearly 100 breweries, breweries in the planning stages, craft beer bars, partners and distributors across the state of Arizona. The guild promotes the craft brewing industry in Arizona by providing educational opportunities to brewers, distributors and consumers. The guild promotes quality craft beers and the responsible consumption of those products. For more, visit ChooseAZBrews.com.